Life is hard. Beautiful, agonizing, wonderful, terrifying, joyous, grief-woven, sublime and small. All at once. We’re (skip down if you want to avoid foul language) fuckups. Even the best of us, even at our best moments. We try to do things, and we fail, we’re self-deluded and we think ourselves wise, we look through a distorted lens and believe what we see to be truth. To use modern parlance, we are Epic Fail. We are. If you think I am wrong, that’s ok. Maybe you’re right. But if what I’m saying makes you angry, may I make a suggestion? Sit quietly for a while and ask yourself why my words anger you. Or don’t. I’m not the boss of you. Be glad of that. I’m a bad enough boss over me. This probably sounds like I’m down on myself, and on humanity as a whole. That’s the funny thing about life, though. It’s full of seeming-contradictions that somehow aren’t contradictory. They just seem like they should be. I’m more free when I admit this kind of crap than when I try to deny it. I’m free to love myself and humanity when I admit that all is not well. When I try to pretend that I am fine, that I’m not a rampaging mess, I find myself imprisoned, and I find myself doing more damage to myself and to others. The more control I take, the less I have. Admission is not the same as acceptance. I admit that I struggle with obsessive-compulsive tendencies, a predilection for addiction, depression, and worse than all of those together, I struggle with selfishness, anger and pride. I do not, however, accept these things. I call them out by name and then I turn and fight. I do all I can to overcome them. It’s the admission of failure, coupled with the desire to continue to fight, that makes me deeply grateful for the action of my Savior in my life. I’m dead tired, both from internal and external battles. And here He comes, to pick me up, to hold me while I sleep. In Him I find freedom even in the midst of the raging war. He frees me from my self-inflicted slavery, and from the slavery of the world around me. I am a mess. But He isn’t asking me to get myself together, first, then come to Him when I am ready. He wants me now, mess and all, and if I will come, then bit by bit, painful though it may be, He will make me into my true, free self. There are some words that, if spoken to another person, spoken as a “you” instead of an “I” or a “we,” become horrible. The following hymn is an example. If anyone can read it, or sing it and not feel that s/he is one of the “sinners,” then it loses all of its power for good. To me, though, in this place, it is a song of life. Because I am a sinner, poor and needy, weak and wounded, sick and sore. And if I tarry till I’m better, I will never go to Him at all. Vanitas/Still Life with a Skull, one of several by Franciscus Gysbrechts, mid-to-late 1600’s. I haven’t many of my own words, right now, which is why I haven’t been posting. What few words I do have are being channeled into fiction and a few friends and loved ones who are facing trouble and pain. Three friends of a close friend of mine, all from the same family, were killed in a wreck. Serious illness and death have touched several people I love. There is death, illness, strain, pain, separation, abuse, stress, and frustration close at hand, and horrible violence, famine, illness, war and death not far distant. In other words, everything is normal for the world. It is easy to think, in relatively peaceful and prosperous countries, that we are safe, and in many ways, we are. It’s also easy to feel ashamed of that peace and safety, knowing so many do not have it. I keep asking myself what that shame means. Is it helpful or harmful, a tool or an attack? It shouldn’t mean that I want what little peace and prosperity there is, in the world, to vanish (or should it?) but that I do not want such things to be so isolated, so rare. Perhaps, so long as it makes me want to use what I have to help, then it is good, but if it paralyzes me with shame, it is evil. But there is something to be learned about both peace and prosperity, for those who are in it: It is, in the end, no real protection. Pain and death will find us. If we delude ourselves into thinking otherwise, or in distracting ourselves until we forget, then we are in for a shock. Different faiths have different perspectives on how this reality should be faced. In my own, Christianity, there are many different angles from which it is approached. There is no single answer, though some folks pretend that there is. There are no pat sayings that cover all angles, though some people like to pretend there are. There is, instead, a mosaic, with space between the tesserae. Be careful what you say to pain. I have to remind myself of this. It’s too easy to forget, we are so desperate to say something, to help somehow, that we do damage. Better to be silent. After all, in silence the Spirit may have a chance to speak without all of our clutter. My mind is very cluttered… and I am certainly not silent, here. But then, what is this blog if not a place for me to vent? Maybe venting, here, will keep me from saying stupid things to someone anon. The painting, above, is a vanitas, a reminder of mortality and of the ephemeral nature of earthly wealth, power, pleasure and wisdom. In this particular painting, the skull is wreathed in dried grass, a symbol of the brevity of life, and the hope of resurrection, as the grass dies every year, but returns every Spring. It is the only thing in the painting that is treated so. I think C. S. Lewis, in The Weight of Glory points out one reason why. Growing up, especially while studying history and biology, I got a very different impression of the world. What is the life of a human, so brief and fragile, to the life of a nation, or the world, or the universe? This is no answer to the question of pain and death, or at least, it is not a complete answer. But it does shift the perspective. If I believe that human’s are, in essence, immortal, then how I treat them becomes much more serious. The responsibility is immense. When we turn our backs on human suffering, we are turning our backs on the suffering of an eternal someone. In Weight of Glory, Lewis catches at a possible risk. A turnabout. It may be possible for each to think too much of his own potential glory hereafter; it is hardly possible for him to think too often or too deeply about that of his neighbor. The load, or weight, or burden of my neighbor’s glory should be laid daily on my back, a load so heavy that only humility can carry it, and the backs of the proud will be broken. How this post rambles! I’m not sure there is a point, or at least not a clear or singular one. I keep coming back to the vanitas. Almost all is vanity, born from dust and to dust returning, but if there is something eternal in that dust, which I believe, then the one thing that is not vanity is the immortal. The pain in my fellows, the suffering, may be finite, but I do not think it is trivial. I’m struggling with that old demon of doubt that tells me I can’t write worth crackers… stale, moldy crackers, at that. It whispers that every effort I make is doomed to failure, and I’d better stop trying. But I am not ready to throw my pen down yet. I may, one day, find that I wasn’t up to the task, but if that day comes, I want to have tried my best. 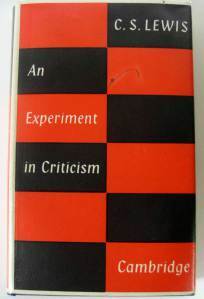 My friend, David, posted this series on Lewis’s “An Experiment in Criticism” a while back. He did not finish it, but this is the last installment he did complete. Reading it has helped me a bit, reminding me that a) I am not alone in my reactions to certain kinds of stories, and b) that stories, themselves, may be more worth telling than the writer knows. Autumn opened its eyes, smiled, still half asleep, and rolled over. At least, that is what it felt like. We had a spell of cool weather, unseasonably, bizarrely cool, but lovely. Right on its edge, I thought I caught the scent of Autumn. There is no smell like it, no smell that quickens my blood that much. It is like the breath of God entering my lungs and enlivening the spirit He once breathed into me. August, in my hometown, is hot, oppressive, and usually muggy (though we are in a mild drought this time). 30+ years living here, and indeed, further south where it is worse, have not helped me to like summer weather. There are things I like about summer. The food is great, the greens of the landscape are rich, some of my favorite wildflowers put on a show and there are awesome insects and migratory birds everywhere. The other day I saw a clearwing moth, and just yesterday, I watched two female ruby-throated hummingbirds compete over coral honeysuckle, native salvia and a feeder. And cicadas. I revel in summer cicada-song! But the heat and humidity wear me down quickly, and I run inside to escape. The three other seasons, though, make up for the heaviness. For one thing, our seasons are pretty evenly spaced, around 3 months apiece. Spring, instead of being a brief link between winter and summer, is a long stretch of flower successions, greening, warming, and rain. It smells of sap and clean earth and breaks through the grays of winter with sharp, vibrant splashes of yellow, purple and white. Then, as the green begins to show, red, orange and blue mix in with the first colors, like a Fauve painting. Winter, here, has little in the way of snow or persistent ice (though we always get some) but it is filled with opalescent grays, fawn-browns, and frost. A hillside covered with mostly deciduous trees looks like the speckled flank of a sleeping beast with a long, soft, gray-brown winter coat. It is subtle, and yet beautiful, like the many grays of the limestone sky. And in the morning, as I go to work in the dark, the street-lights set lawns and leaves sparkling with frost. It is as if every surface of the world is covered in glitter, and the smell of frost quickens the cold air. But autumn. It leaves the rest behind. For some reason, the season of dying is life-giving to me. Sumac is the first to turn, a brilliant scarlet, brighter than flame or blood. The sugar-maples, perhaps the most spectacular, create a spectrum that runs from green, through yellows and oranges and into red, all at the same time. They look like shards of living rainbow. Sweetgums turn dark crimson, purple and black. Each tree species (and sometimes each tree) has its pattern and its method, and we have well over 100 species here. Some non-evergreens even retain their dead leaves to whisper through the winter, shedding them only when the new growth arrives in the spring. One of my favorite species, eastern red cedar (which is actually a juniper) is an evergreen, though it takes on a winter sheen of dark bronze. But if it were just about visual wonder, Spring and Autumn would be equally loved by me. They are not. Spring breaks into winter just when I am weary of the gray. It is welcome and enlivening. But there is something about Autumn air. It blows across my mind, causing the embers there to redden, dusting away the white ash until flames flicker to life. It sparks my creativity, my well-being, my life. The taste we had recently whetted my appetite for that rare wind. I am never satisfied, it is never enough. Even in this place, that has a long autumn, it is too brief. But for that short time, every year, I seem to touch something beyond myself. Perhaps it really is a time when the boundaries between worlds grows thin. I do not fear fairies, or the dead. What I feel coming near is different from that. It is the Christian song. I feel like I breathe in eternity, that eternity that is already here, present within me, but that I do not fully understand. Not yet. Not yet, but one day. Until that day, I have the contradictions, the mystery, a keyhole through a door. Autumn, dying and living, curling up to sleep, comfort in fear, but not a vulgar fear as of being afraid. I am not afraid, but my heart is racing. It is so hard to express. I think C.S. Lewis and G. K. Chesterton are right about that desire. The desire I feel that is soothed a little in this world, but never satisfied, the hunger for the excitement of adventure coupled with the comfort of coming home, that contradiction in my soul during Fall, fear and comfort, excitement and peace, thrill and balm. I think of Bilbo Baggins. That journey at my feet, the road tugging at me, that song in the wind. Maybe that is why Bilbo’s song always brings me tears, good tears, and makes me think of Autumn. -J. R. R. Tolkien: From Bilbo, in The Hobbit and (the last stanza) Lord of the Rings. *I’ve been told that this post can easily be taken as disrespectful to other beliefs. If you find it so, I apologize. That was not my intent.